Holiday party season is around the corner, and I've been using some of my time on the weekend to stock up the pantry. One of my favorite items on charcuterie boards and cheeseboards for planed or impromptu cocktail parties are pickled grapes. Bright, not too sweet, and packed with flavor. Try them out....you'll be a pickled grape addict! 1. Prepare your jar and lid by thoroughly cleaning and drying. Add cloves to the bottom. 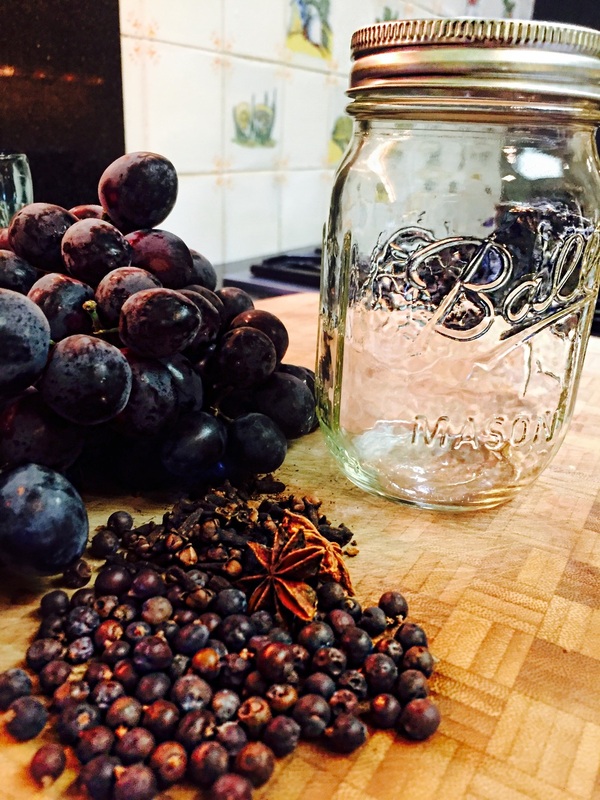 Pack whole grapes into the jar half way, and disperse the other spices (star anise, pepper, and bay). Don't crush the fruit, but pack in tightly. 2. In a sauce pan, begin heating the apple cider vinegar. Add the sugar and crushed juniper berries, then bring to a boil. Boil for five minutes. 3. carefully pour in the vinegar solution with the juniper. Fill to the top, and secure the lid. Let the jar cool and then store in your fridge. The pickled grapes will be ready to roll the next day. Enjoy!